When I first began blogging poetry, I participated in a critique group hosted by English poet, Luke Prater. Eventually he dissolved the Facebook Group, yet now and again, I run into one or another of those participants here at dVerse. In fact, that is where I first met Claudia and Brian and Luke was one of the original pub-tenders here at dVerse. In December of 2010, Luke invented a form called the Octain, full name Octain Refrain. I recall enjoying working with the rhyme and meter and the results it gave me. while nightingale begins to sing. that moseys down along the brook. to go outside, I close my book. thoughts muddled so that sight’s unclear. to visit them and draw them near. Too many lives are spent in vain. If you would like to see an example of a High Octain, I’ve posted one just last week here. Good Thursday, everyone! Victoria will be a little late today, but the bar is now open! Thanks for opening the doors, Mary and Grace. Back home safely after a visit with my mom and looking forward to reading your Octains…and, hopefully, writing one of my own. I thought this was a most interesting challenge! Thanks, Victoria, for introducing us to this form! Happy Thursday and Happy Easter !!!! Hi everyone…welcome! Grace, I had to use Rhyme Zone to help with my rhyming but I loved the prompt. Thank you, Victoria, it was fun. Thank heavens for Rhyme Zone! Luke was the one who first hooked me into dverse. He gave me some of the best and most memorable comments and critiques I’ve ever gotten. He and Arron. I think they’re mostly Twitter-pated now. … I need to get back in touch; it’s been way too long since we hooked up. I used rhymezone online too ! It’s my go-to helper these days. What a fun form! And I definitely used Rhymezone.com. That and the online Dictionary.com thesaurus are my go-to resources for poetry writing. I’ll be back later to check out the other postings. Glad you’ve enjoyed it, Linda. Thank you for this challenge, Victoria. It looks so interesting, I’ll try to write something this evening,. No promises, though – I’ve had a very busy day! I understand, Kim–I’m a bit swamped, too. Music is such a great source for metaphor. Glad to check in, at last, and looking forward to seeing what you have done with this unique form. Glad you enjoyed it, Edward. I remember these well. They are challenging but I wanted to write a new one for this challenge. Thanks for putting them up here today, Victoria. I think poets will enjoy these forms. They elicit something new while working to the strict meter and rhymes. So glad you are here and, of course, not surprised you did so well with it. Happy Easter to all those who are celebrating 🙂 sharing my poem “Easter Eggs” hope you guys like it. Thank you Victoria for the lovely opportunity! Happy Easter, Sanaa. We are celebrating this year in Bermuda — return home to Boston on Tuesday. Happy Easter to all! Bermudians celebrate Good Friday — it is a national holiday….there is a Passion Walk in St. George’s and then traditional kite flying (home made kites with hummers attached! ), fish cakes, hot cross buns, soap box derby….family time. The day has dawned sunny with a slight breeze — perfect for kites! That sounds wonderful Lillian 🙂 wishing you Happy Easter as well. Sounds so beautiful, Lillian. Kites with “hummers”? I’m having a problem writing at this time of night, so I’m posting one poem that isn’t strictly true to form. I think I might have another go in the morning! Glad you are here–I haven’t written mine yet, either! Hello all. Will be back later to link, read and comment. This is an interesting form to follow….not persnickety or full of rules…a nice tight form. Hope you all are having a ggod day. 75F, sunny, flowers blooming, DC and Japan cherry blossom viiewing and festivals in full swing…in spite of all the bad news and politics, it is still a world of beauty and hope. And I have hope the people of Brussels will continue to be brave and to be strong. Thank you. My hopes mirror yours. It’s a gorgeous world, and most people carry peace in their hearts and hope for that peace on earth. I also believe this. Let there be peace, let it begin with me. I hope you enjoy the form, Toni–and with you, heartbroken about yet another tragic attack. Finally got my Octain written. Also used De’s prompt for Poetics. Good to see you and glad you enjoyed it, Kathy. There’s a problem, Victoria: reading your octains and your fabulously musical high octain has left me feeling inadequate! I have an idea brewing, which I doubt will make it before the bar closes, so I’ll probably save it for OLN. I’ll be sure to check it out on OLN, Viv. I do that, too. It’s another poetic sudoku! 🙂 Bermuda is calling this morning — and we’ll be off to see the fully costumed passion walk right here in St. George’s — and then take the bus to St. Davids cricket club with this end of the island has wonderful festivities on Good Friday, which is a National Holiday in Bermuda. Kite flying (Bermudians pride themselves on making their own, complete with a cross somewhere on the kite and hummers — they make noises when they zig and zag in the sky) is a national tradition on Good Friday. We are so looking forward to joining in this wonderful day. So — I suspect I will be very late to the bar again — probably post tomorrow. 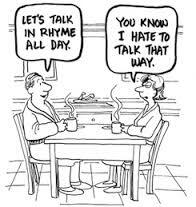 Rhyming isn’t my au naturale way — but I’m game! 🙂 See you all tomorrow. Wonderful traditions, Lillian. And Blessed Easter. I just had to pop in to read. The Octain is one of my favorite formats, and I’ve written several. What I like most is that it is the format is short and concise, and is very specific with 8 syllable lines and internal rhyme. For me, because of it’s brevity, the format is an easy one to work with. Its been awhile since I shared here and have not been writing as much (husband still recuperating from illness), but thought I’d participate this time, if onlyshare the last one I wrote. I will pop back in after work today to comment on others! So glad to see you. I understand the what happens when you are a caregiver, and it’s good to see your husband’s progress. Hello everyone. After reading some of the posted poems, I decided to give this prompt a try. Have a good Friday and weekend everyone. So glad you are here. It helps me to read other’s poems, too. Did it! Just posted. I cheated a bit and used the same end word twice….hope that’s okay. Had fun with this poetic sudoku! I found Rhymebrain Rhyming Dictionary. Worked well. Thanks for this prompt. Thanks–never heard of that one. Phew! I made it. Now to read some more octains. Wonderful–and a High Octain, no less. Bravo, Mish! That’s what MTB is all about. Off to read it now! Thanks for joining in, everyone. It was a delight to read your work. I will check in again in the morning in case there are any last minute poets out there. Happy Easter to all who celebrate it. And happy spring to all of us. It’s all about rebirth, new life. Very late to the party. Back later to get high on everyone’s Octains. Thank you, Victoria. Once I dug in, I liked this form. Glad you made it! I love your poetry and had fun with Tuesday’s prompt incorporated into my Octain. I’ve been around to everybody, and LOVING the responses to this fun form! Glad you got such a great turnout, Victoria! It is a fun form. Thanks, De and Happy Easter.